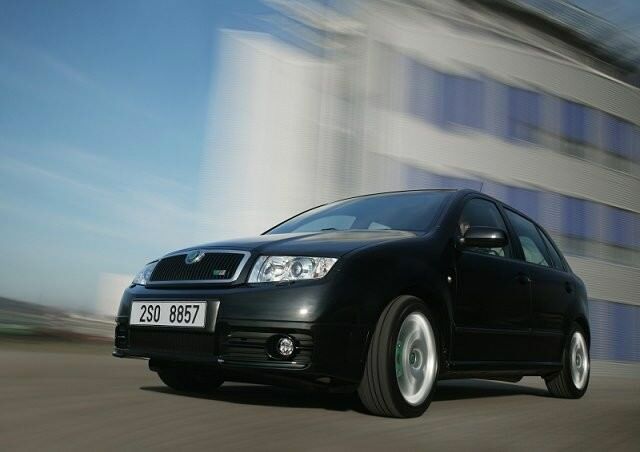 Skoda's Fabia can rightfully be recognised as a turning point for the Czech brand in Europe. Skoda's Fabia can rightfully be recognised as a turning point for the Czech brand in Europe. Now firmly entrenched as part of the Volkswagen Group (VAG), Skoda benefitted from the buying and engineering might of its parent company, the Fabia borrowing its underpinnings from the Volkswagen Polo. Indeed, as the Polo followed the Fabia into production it could be argued that the Polo is based on the Fabia. A smart looker, well-engineered and priced sensibly since the Fabia was introduced in 1999 the firm has never looked back. Given those underpinnings it's no surprise that the Fabia competes in the supermini segment alongside the Volkswagen Polo, Ford Fiesta, Toyota Yaris, Nissan Micra and a whole host of other options. Unlike many of them the Fabia has only ever been offered as a hatchback in five-door guise - there is no three-door version from the Czech firm. The only other choices are the estate, or Combi, and a four-door saloon model, which is a popular choice here in Ireland. All offer decent passenger space inside, while the Combi really does add some useful extra load capacity over the hatch or saloon. It's one of only a handful of small estate cars offered in the marketplace, and is a favourite among buyers. Engine choices are the same across all body styles with 1.2- and 1.4-litre petrol units, a 1.9-litre SDI diesel or, on later models, a 1.4-litre TDI turbodiesel. The 1.2-litre petrol model makes up the bulk of used choice in the classifieds, followed by that 1.4-litre petrol, then the diesels - which are relatively rare. Economy from the petrol engines impresses, though the three-cylinder 1.2 isn't the most refined engine around. It's willing enough, but rev it hard and noise and vibrations are fairly intrusive. Specifications follow the Skoda norm, so is made up of Classic, Comfort and Elegance options. A few others joined the line-up through its long lifecycle, as did a handful of special editions, though Comforts and latterly Ambiente models make up the biggest choice in Ireland. They come with electric windows and remote central locking, though Elegance is required if you want air conditioning. That depends entirely on your expectations for load carrying and preference of hatch or saloon. All have merit, but the 1.2-litre engine in Comfort trim brings the greatest blend of choice and useful standard equipment. Simple, honest supermini motoring. Inexpensive to buy and run the Fabia is difficult to get excited about, but then that's a huge part of its appeal. If you're after a compact estate, there aren't many around, or many better.